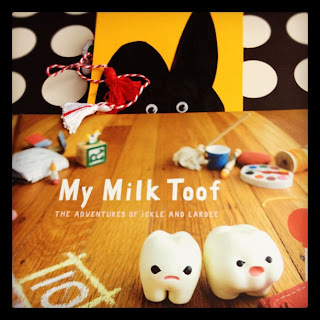 No doubt one of my favorite blogs is My Milk Tooth. ickle and Lardee are the most adorable cute little guys that one can imagine. Each new post makes me melt. They are so adorable, the story is always catchy and the details are unbelievable sweet. I was joking with a friend saying that you can get toothache so sweet they are. I gave the book to my boyfriend as Christmas gift and it was one of the best choices I ever made. Look at Rabbit, he can't get his eyes off the book. It really makes a great present for friends and kids. I will buy it for sure again also to support the artist and keep the story on. She is doing such an amazing job!